If your current website isn't bringing the business you had hoped it would, you might want to think about evaluating it. No website is perfect; there is always something that can be changed or improved. As a business owner, ask yourself a few questions about your current website to see where it stands against your competition. Below are some questions you should ask about your website. Broken links are dead weight on your web site. If your visitors are trying to navigate to a page that doesn’t exist, they will get frustrated and most likely leave. Go through your website and make sure that links are going to where they are supposed to. Is my contact info on my site? Your contact information should be easy to find on your website. Add your email, phone number, address, and any other necessary contact information to your site. If you make it easy for your visitors to contact you, they will! A website that is hard to read will make people want to go somewhere else for their information. Make sure you use fonts that are easy to read and colors that work well together. These are just a few of the things you can evaluate about your site that can make a big difference, but there are plenty of other aspects you can evaluate to make your website better. For a limited time, ACF is offering free website evaluations, valued at $250! 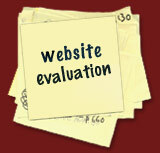 We use an in depth checklist to evaluate websites and give recommendations on how they can be improved. To find out how you can get a free website evaluation from ACF, click here.